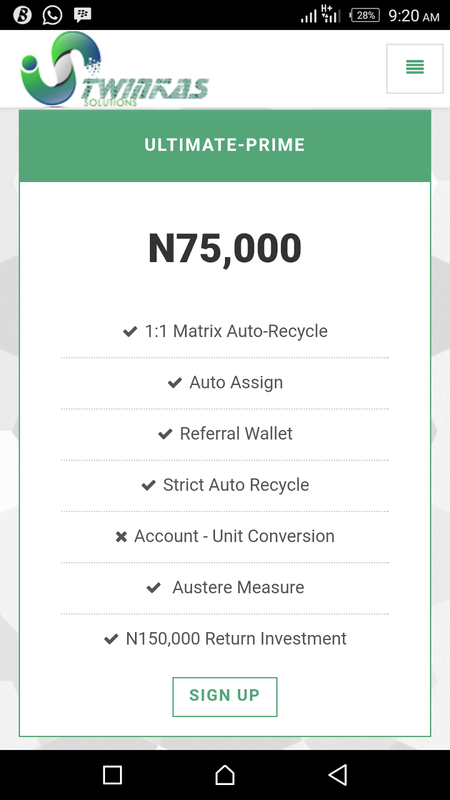 The Elite Package: This package is somewhere between the Premium Package of #20000 (twenty thousand naira) and the Ultimate package of #50000 (fifty thousand naira). To apply for the Elite Package you have to make a donation of #35000 (thirty five thousand naira) and get back #70000 (seventy thousand naira). The Ultimate-Prime Package: This package is somewhere between the Ultimate package of #50000 (fifty thousand naira) and the Veteran Package of #100,000 (one hundred thousand naira). The Twincash Package: This is now the highest paid level or package in the Twinkas platform right now. In this package, you have to make a donation of #200,000 (two hundred thousand naira) to get back #400,000 (four hundred thousand naira). Twinkas have really raised the bar for it’s participants with these new packages. Meanwhile, the platform is yet to pay off all its debts. There have also been removal of two packages from the platform. Happy Twinkling..